Le Club Accorhotels has an offer for Novotel stays in the UK that are minimum of 2 nights and booked at least 3 days in advance between March 6 – September 6, 2015 (book by June 22). You can get up to 30% off, have breakfast included in the rate and earn 500 bonus Le Club Accorhotels points. Note that there is a similar offer for Novotel stays in the UK that requires 21 advance purchase (access here). The terms and conditions are contradictory with the promo period. The offer cannot be booked more than 21 days in advance, but the you must book by June 22 for stays until September that is impossible. 1. 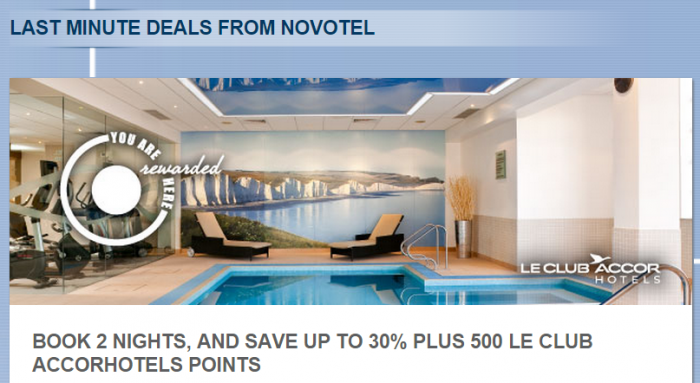 General Le Club Accorhotels terms and conditions apply to the “Novotel Spring Offer” offer. 2. This offer is valid for a stay from “6th March 2015” and “6th September 2015” in one of the participating hotels in “UK&I” and booked between “4th March 2015” and “22st June 2015”. 3. This offer entitles Le Club Accorhotels Loyalty members, regardless of their status, to benefit from earning “500” points in one of the participating hotels in “UK&I”. The stay must be a minimum of “2” night(s) and booked from 21 to 3 days in advance.